A petition floated by one George Pattery, condemning the allegations and defamatory charges against Fr Stan Swamy from Ranchi by the Pune police as under the Unlawful Activities Prevention Act, 1967 (UAPA) as false, says, "These charges frame him in the Bhima Koregaon case, call him an 'urban naxalite', and accuse him of plotting the assassination of the Prime Minister. They are patently false and defamatory", the petition says. Pointing out that the police forces of Maharashtra led a witch hunt of human rights activists, poets, teachers, lawyers and trade union leaders on August 28, 2018 across several locations in the country, the petition, addressed to Maharashtra chief minister Devendra Fadnavis, adds, "They have viciously attacked those who fight for the rights of the poor, dalits, women and indigenous peoples (adivasis)." The petitioner says, "Indifference and apathy of the Supreme Court of India is seen towards the violation of basic human rights of those arrested and who are being targeted by the police in the Bhima Koregaon case. Meanwhile the real perpetrators of violence, Sambhaji Bhide and Milind Ekbote roam free, for the police have stopped pursuing their cases. If anything, this exposes the nexus of the ruling party and the police." 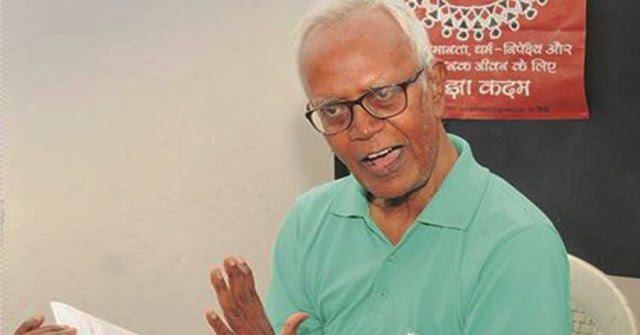 Demanding that "malicious" cases against Fr Stan Swamy and all those who have been falsely incarcerated in the Bhima Koregaon riot be immediately withdrawn, the petition, seeking 5,000 signatures, regrets, "The police issue an unconditional apology for the trial by media by releasing fabricated evidence in the public domain." According to the petition, "That the police pursue the FIR No. 01/2018 lodged at the Pimpri Police Station, Pune in which Sambhaji Bhide and Milind Ekbote, the prime accused in the Bhima Koregaon violence have been named, and accordingly an application for cancelling bail to Milind Ekbote be made immediately."